Flying Wild Weasel missions involved a variety of airframes but just one philosophy: Do unto SAMS before they do unto you. An F-100F, the two-seat version of the old frontline fighter, is leading a flight of four F-105D Thunderchiefs streaking behind a ridgeline into North Vietnam on December 22, 1965. The specially equipped F-100 is searching for surface-to-air missile (SAM) sites, to which it will lead the four F-105s. 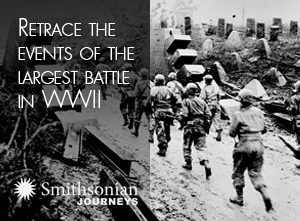 It had been only seven months since U.S. pilots had begun to fall to this dangerous weapon. As the hunters head into the SAM's lair, they aren't sure whether they will find it or it will find them. In the back seat of the F-100, known, because of its unique mission and electronics, as a Wild Weasel, Captain Jack Donovan, an Electronics Warfare Officer (EWO), is intently focused on his instruments. In the front the pilot, Captain Allen Lamb, scans the terrain and keeps the flight low. The four F-105s have spread out behind Lamb and Donovan. As they pop above the ridge, Donovan gets a bearing on a tracking radar and yells a warning over the intercom. The flight drops back down to hide below the protective masking of the ridge. When the aircraft come to the end of the ridgeline, they are suddenly over a flat valley. The flight turns left and starts to climb. Strong radar signals are displayed on Donovan's scope in the rear cockpit of the Weasel. Lamb climbs higher, scanning frantically. There--in a small village to the left--a control van camouflaged to blend in with a surrounding village, and several white missiles. He pulls up sharply and rolls back down on them. He fires his two pods of rockets, but they hit short. Selecting guns, Lamb strafes the site with 20-mm cannon fire, explodes one of the long missiles, and pulls the sight up to the van. As he pulls up, the following Thuds roll in on their passes. The first SAM site in North Vietnam has been destroyed by a Wild Weasel-led attack. The raid was a mere pinprick to North Vietnamese air defenses, but it represented the first use of specialized detection equipment cobbled together to detect the hard-to-find missile sites. The SAM wasn't a new weapon; it was first developed by the Germans during World War II, but not used in action. U.S. strategists had known about the Soviet-built SA-2 used in Vietnam since 1953. The missile was thought to have brought down Francis Gary Powers' U-2 spyplane in 1960, and one did destroy a U-2 flown by Rudolph Anderson two years later during the Cuban Missile Crisis. But the U.S. military did not begin to develop countermeasures until the missiles became a constant menace to U.S. aircraft conducting coordinated offensive strikes against North Vietnam. SA-2 missiles were more than 30 feet long, carried more than 250 pounds of explosives, and could reach Mach 3.5 in pursuit of a target. Five months before Lamb and Donovan's mission, these weapons had drawn first blood: a flight of four F-4C Phantoms, climbing out from a strike north of Hanoi. One aircraft was destroyed and the remaining three sustained severe damage. In response, the Joint Chiefs of Staff directed a raid three days later against the suspected missile sites and supporting facilities, inside the once-restricted zone of Hanoi. The flight was mauled by anti-aircraft fire, and six aircraft were lost (see "Tullo and the Giant," June/July 1997). Americans needed ideas, and the problem fell on Air Force Brigadier General K.C. Dempster, who began recruiting military and civilian technicians for a task force that met first on August 3, 1965. The urgency of the committee's task was brought home to them when a SAM claimed its first Navy victim--the pilot of a Douglas A-4 Skyhawk--shortly after the committee formed. Adding to the pressure, U.S. policy dictated that SAMs had to be faced after they were set up and operating. To the great frustration of U.S. air crews who watched the construction of SAM sites encircling Hanoi and North Vietnamese airfields, striking those missile sites, or even attacking cargo ships or trucks bearing the components, was not permitted. Dempster's committee recognized that the most obvious danger was posed by the SA-2s, but it was the invisible waves emanating from the radars (code-named Fan Song by NATO) guiding the missiles--and from Fire Can radars directing anti-aircraft artillery (AAA)--that represented the key problem to technicians devising effective countermeasures. After first setting as a priority a reliable radar detection system, the team discovered that the technology already existed. Two radar homing and warning (RHAW) systems had been developed in response to an earlier Air Force requirement and were already in limited use in secret CIA air operations. Bendix had developed one system, and a small, relatively unknown company, Applied Technology, Inc., had produced a system packaged in five small gray boxes. The equipment, designed to help large aircraft avoid and jam radar, was called a Vector Sector, and it provided the basic electronics that could be used for offensive operations against SAM sites. Because the signals required to shield a large aircraft required so much power, the existing designs placed antennas strategically so that the jamming signals could be directed only where needed. "That [equipment] was in use at the time that all of the excitement began with the SAMs' arrival in North Vietnam," says Mel Klemmick, a former ATI field engineer. "There were certain people in the Air Force involved in those programs and they were aware of the capability, but no one could talk about the capability. We were the builders of both the jammers and direction-finding equipment, and we took a Vector Sector and repackaged it and gave it another number." But even before the equipment--which was designated the Vector IV system--had been designed, the elusive signals had to be analyzed and interpreted. "Unacknowledged, I think, is the work that went on in the background to break the codes for the guidance signals," Klemmick says. "There was a lot of coordination between the intelligence community and companies involved--more than just ATI--coming up with a way to figure out what those original guidance schemes were." 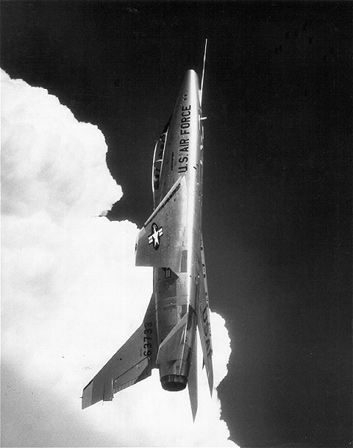 The two-seat North American F-100F was selected to undertake the new mission. 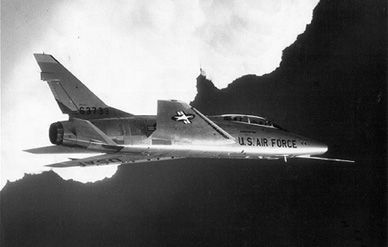 The F-100 (or "Hun," short for "hundred") was the Air Force's first supersonic fighter and was loosely derived from the legendary F-86 of Korean War fame, but by the time it was flown in Vietnam, it was being outpaced by newer and faster fighters. John Paup of North American Aviation was named program manager. Given the urgency of the situation, a meeting was quickly organized with ATI representatives in August 1965 to hammer out an agreement, and in an unorthodox manner that was to live on in Wild Weasel lore, the details were written on a chalkboard in a briefing room, signed by the authorized representatives, and photographed as the binding contract.